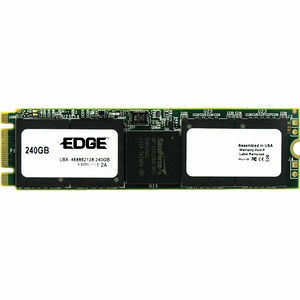 As one of the smallest Solid State Drive (SSD) form factors available today, the EDGE Boost M.2 SSD is an excellent storage upgrade choice for Ultrabooks and Small Form Factor PCs. Available in three lengths (2242, 2260, and 2280), Boost M.2 SSDs can accommodate most systems accepting the M.2 SATA storage form factor and are PC, Mac, and Linux compatible. Boost M.2 SSDs come equipped with AES hardware encryption that protects 100% of data when enabled. * The feature-rich SandForce controller provides tools such as TRIM, S.M.A.R.T., Garbage Collection, Wear Leveling, ECC, and Durawrite to promote drive reliability and efficiency. The Boost M.2 SSD is backed by a 5-year warranty.